Artifact 2-6-S-32 + Artifact 2-6-S-03A & B...from luggage? Saw this and keep thinking of combining the "switch" artifact with the 90* bent "gidgy". Perhaps the plastic scalloped piece is just a crest or something on the outside of a case? I don't know if the scale would work out, but it seemed the shaft on 2-6-s-32 was very similar to the diameter of the hole in the gidgy. How the knobby end gets through I don't pretend to know. I was wondering if the makeup/mirror/gidgies, etc weren't all part of an old luggage makeup case, perhaps an Earhart brand piece. The marketing for the Earhart luggage touts it as handmade, as the gidgies might be. There are "garters" inside those old makup cases for holding bottles and the like against the edges of the case. My theory was that perhaps the serrated edge of 2-6-S-03A & B artifacts were for holding a "garter" in place. Re: Artifact 2-6-S-32 + Artifact 2-6-S-03A & B...from luggage? On the possibility that 2-6-S-03A & B are luggage related I did a search on wholesale hardware for luggage about a year ago. E-mails to a supplier, Ohio Travel Bag, were unfruitful. They had no idea. I would suggest attempting to find a museum or collection of vintage hardware catalogs. I also joined the "knots" community on the "Fine Woodworking Magazine" website. I posted pics of the gidgies asking if anyone recognized them. There were no useful replies. Amelia Earhart Artifacts?? I originally asked the editors if the question could be included in the magazine. They directed me to the web community. Didn't Fred have some luggage made for him in West Africa (will look for link later) so these could be luggage related but bespoke so nothing similar available. Luggage makes sense as you would need something to store and carry items from the plane to your camp site. Here's an item on eBAY that is a navigators case from the period. 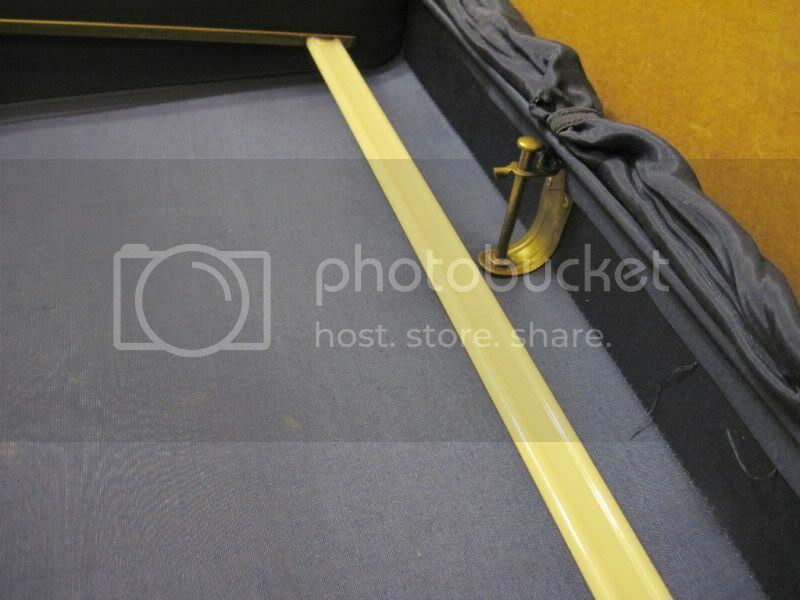 Use the Enlarge link, and check out the very bottom of the bottom two pictures where the leather straps are attached. While it makes sense that the "gidgies" in question could have come from luggage, the rough look about them suggests to me that they may not have been intended to have been seen wherever they were employed. Anybody have any 30's luggage they can tear apart? I doubt very much that these came out of a factory. I imagine (hallicinate?) that someone who had some time on his hands made them for a very definite and personal (non-commercial) purpose.